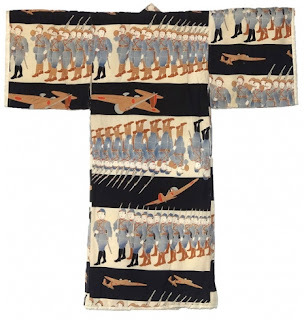 Via the always excellent Everlasting Blört, we are directed to the archives of Dangerous Minds and given a lesson in the propaganda kimonos produced in Japan from the turn of the century through the war years. Unlike more visible banners of provocation and hate, the above, 面白柄, denote a private novelty on display in the home only or perhaps as the interior inner lining of apparel—in any case, for a restricted audience and not for public display. This particular garb, celebrating industrial progress and the war-effort and ultra-nationalism alike, has garnered considerable scholarship of late and more excellent specimens are to be found curated at the links above.